Firstly the Anne Beadell is NOT a highway. 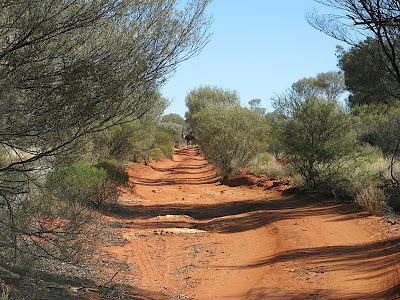 It's a sandy, corrugated, single lane desert track and quite overgrown for long stretches. 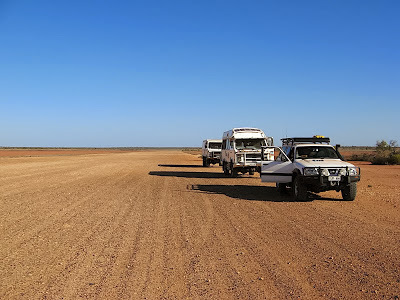 And although fairly straight and mostly flat (with a few wash-aways),it is a very long track (nearly 1500 kms from Coober Pedy to Laverton, including essential side trips) and crosses the Great Victoria Desert. 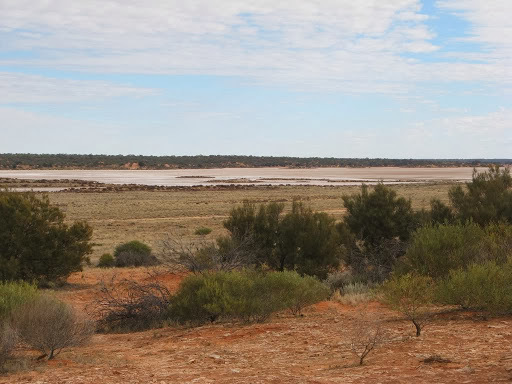 There are almost no water sources along the track and only one fuel supply point, at Ilkurlka, 170 kms west of the WA/SA state border, 700 kms west of Coober Pedy. The track is very corrugated and can take at least 7-10 days, plus an allowance for breakdowns and other stoppages. We did it in about 11 days in the company of 2 other vehicles, which was very handy for the inevitable problems and breakdowns. 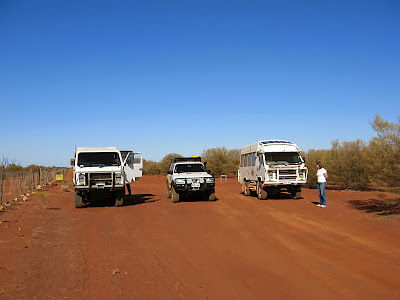 The Anne Beadell Highway completely traverses the Great Victoria Desert in South and Western Australia. 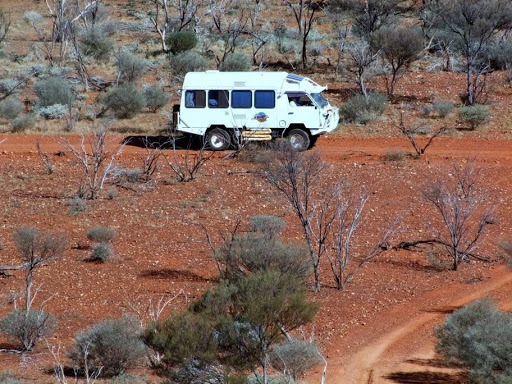 Several permits are required for the track since it crosses 2 National Parks, the Woomera Prohibited Area and aboriginal land in both states. The track is also very narrow and corrugated for most of its length so breakdowns are common and should be anticipated. There are a few winding sand dune areas to add interest but it's no place for trailers and certainly shouldn't be tackled alone. Fortunately (actually through good planning) we were in the company of 2 other vehicles which proved invaluable when the inevitable breakdowns occurred, which we all suffered to some degree. 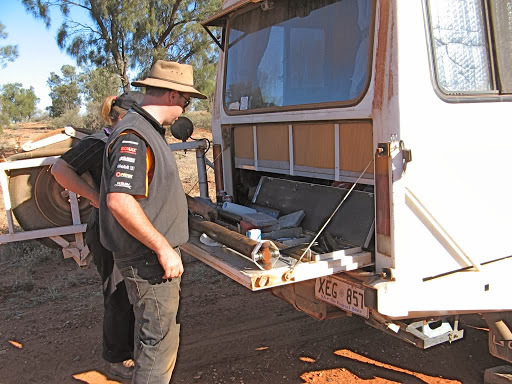 Due to the nature of the track, going will be slow and the whole trip to Laverton will take from 7 to 10 days, more if breakdowns happen, so supplies and provisions should be taken accordingly. We actually took about 11 days and met quite a number of vehicles coming the other way. Some were driving way too fast, to do it in 3 or 4 days, and you can't enjoy it much like that, quite apart from the increased risk of breakdown. The SA section of the track is certainly the worst as far as corrugations go. The WA section is better but still not very good, but has been graded for short distances around Ilkurlka Roadhouse. The Yeo to Laverton section is excellent. Water is available at 3 rest areas on the WA side of the border (assuming rain has replenished the tanks), but there is NO reliable water available on the SA section. However, there are quite a few points of interest, plus some impressive desert scenery. More importantly, it's a remote travel adventure that few people have ever heard of let alone ever go on. It's not hot during normal winter travel periods so lack of water is not the severe problem it might be on more northerly tracks. In fact it was so cold we could have a campfire every evening and enjoy a comfortable walk up the sand dunes during the day, and there weren't many insects about either. 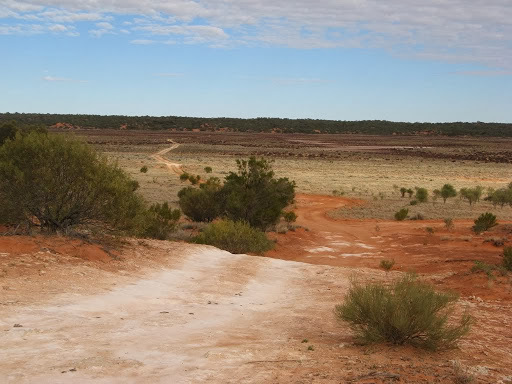 The track starts at Coober Pedy and this is where all our fuel and water tanks were filled to the brim. The first 50 km was fine as it follows Mabel Creek Station tracks, then it started to get progressively narrower, rougher and more corrugated. The first point of interest is Tallaringa Well, an important aboriginal water source that had first been discovered by European explorer Richard Maurice in May 1902 (see this report), but had then been lost for years until Len Beadell rediscovered it in 1951, during his survey of the eventual Anne Beadell Highway from Mabel Creek Station to Emu. See this SA Memory site. Although the Len Beadell plaque here is dated 1951, the track was actually built in stages from 1953 until its completion in 1962. 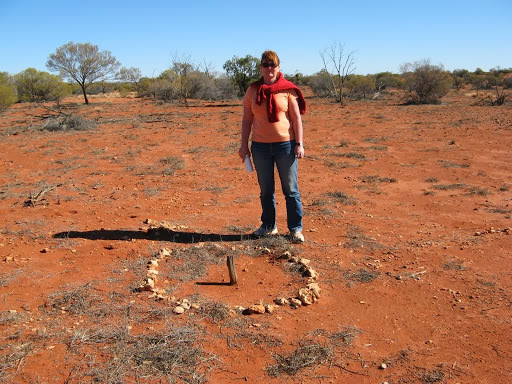 The reason is that this area was surveyed for atomic test sites in 1951 and centre line pegs from Woomera were marked out before the Anne Beadell was built. Len Beadell rediscovered Tallaringa Well in June 1951 whilst surveying for the nearby 250 Mile peg. 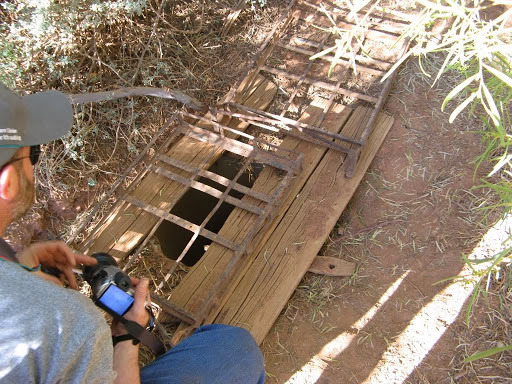 The well was not in good condition and it may or may not have accessible water in it. Even if it does, I don't think I'd drink it unless desperate, and anyway it's only 200 km to/from Coober Pedy. There is much more remote country to follow and reliance should not be placed on natural water sources. 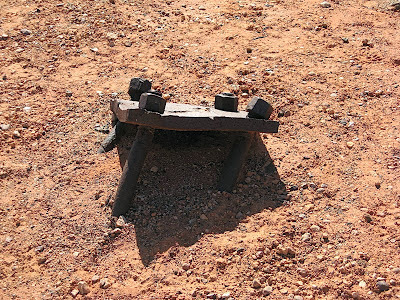 This small claypan is on a side track about 50 km north of the Anne Beadell and was the initial aerodrome prepared by Len Beadell to allow supplies to be flown in for the atomic test sites. It has a wet looking, but glassy hard surface and the 44 gallon drums marking the landing strip can still be seen in the lake surface. 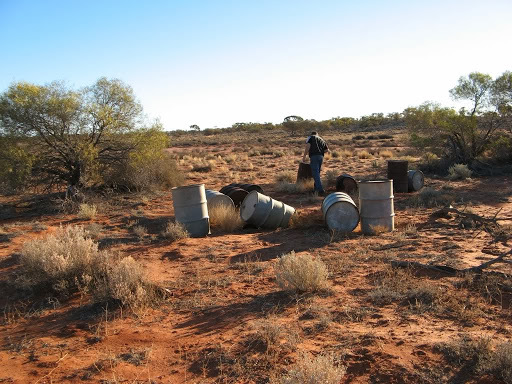 There are also plenty of other drums laying around the area, some still containing fuel. 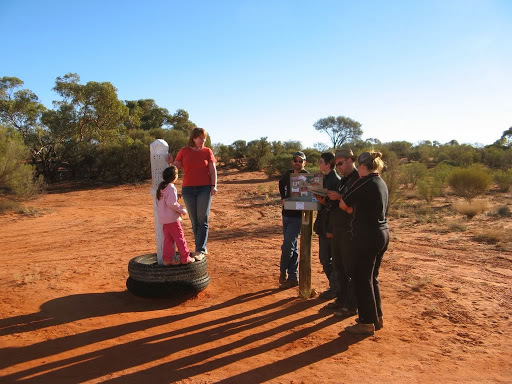 The 300 M peg (down range on the centre line from the Woomera launch site) is accessible from Dingo after driving around the claypan and then a further 9 km into the scrub on a marked track. 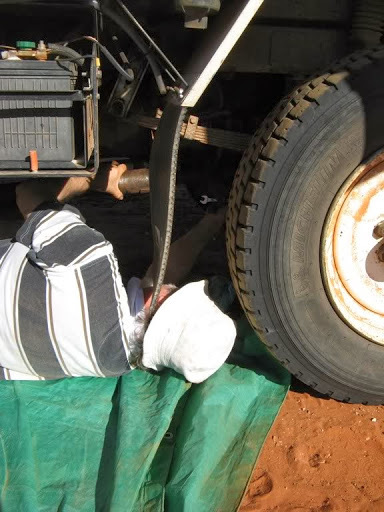 While we were at Dingo Claypan, we had to remove the front bullbar to replace a broken bolt. This is not an easy task on any vehicle and especially an Oka, but luckily we had fellow travellers with us to help with the heavy lifting. We also had to fix a slow puncture and recover fuel from a leaking spare tank. Just the usual problems we expect to face on a rough outback track. Other breakages included aerials, the overhead fan which broke it mountings and pop rivets which popped from the aluminium brackets holding the solar panels. Oh, and the front drive shaft broke. More on that later. 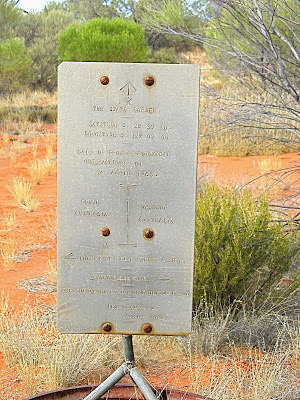 About 6 km past the Dingo Claypan turn off is a track to the sites of the actual atomic tests. 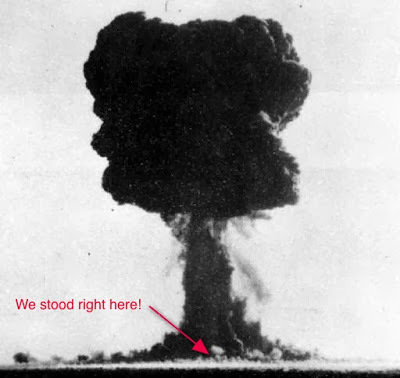 Two bombs were detonated at Emu Field on the 15 and 27 October 1953, and 7 more subsequently at Maralinga about 200 km south. 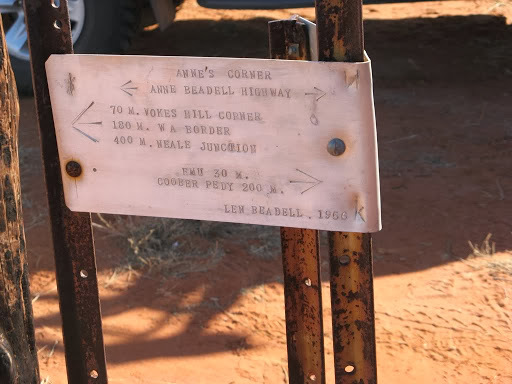 Len Beadell built the roads and tracks to support this project, some of which are still accessible, although Maralinga access is still very restricted, and for good reason. See the findings of the Royal Commission. You can visit the sites of the Emu Field bomb tests and it's quite an eerie experience standing on the very point where an atomic bomb was exploded. Not many people do that and survive! It's a weird feeling being at ground zero and seeing lumps of molten glass all around you. 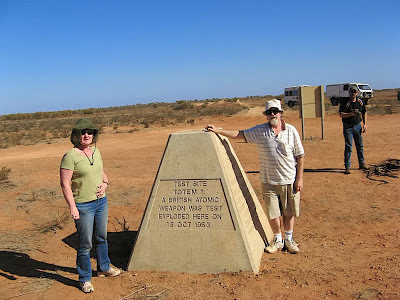 See our blog here for a more detailed review of the British Atomic Test Program in Australia. The first 2 bombs, code-named Totem 1 and Totem 11 were 9.1 and 7.1 kilotons respectively, not big by super-power standards, but they made quite a mess of the ground. Of the 100ft towers they were mounted on, only a few buckled frames remain on the ground, and the surrounding desert is covered in glassy lumps of molten sand where it was heated to incredible temperatures by the explosion. Concrete obelisks now mark the Ground Zero points and a level of radiation still remains, but it is no longer classed as dangerous for casual visitors and there are no restriction on visits. Radiation is now at a low enough level to allow short duration visits, but not permanent habitation in the area. Prudence suggests that visits be as short as possible, and no earth or other souvenirs, like glassy lumps of molten sand for the mantelpiece, should be taken away. They might glow in the dark, or worse. 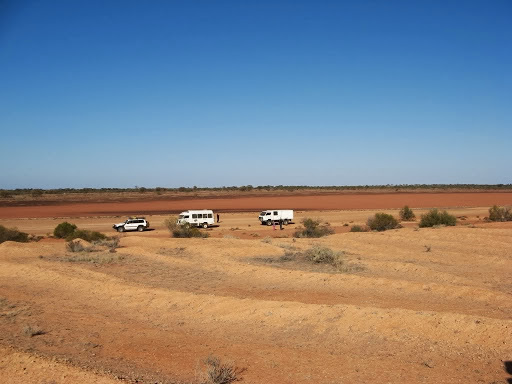 The airstrip on Emu claypan is a larger all weather airstrip prepared by Len Beadell for subsequent tests and is still in good condition today. Originally there was a residential village established nearby and the whole area was known as Emu Field, but little of it now remains. Odd pieces of old electronic equipment are scattered around the northern end of the airstrip. 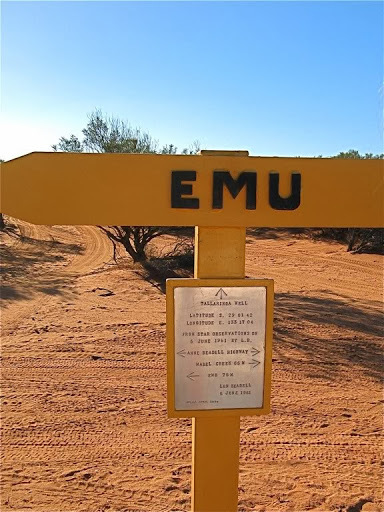 Ironically, Emu Field was subsequently determined as being too remote for follow up tests. Now you would think that remoteness would be a prime requirement for atomic tests, but apparently not. 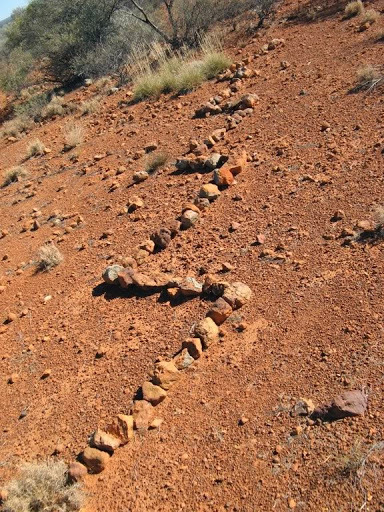 A location more convenient to the Trans-Australia railway was sought so Len Beadell was tasked to find a suitable site and Maralinga was the result. Anne's Corner is at the junction of the Mt Davies Road built by Len Beadell in 1956 to provide direct access between Emu Field and Giles Meteorological Office about 600 km to the northwest. 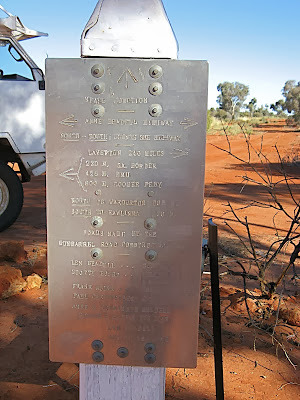 One of Len Beadell's original plaques is located at here, bolted to star droppers in a 44 gallon drum, it's dated 1956, and located 200 M (300 km) west of Coober Pedy, 400 M (600 km) east of Neale Junction and 260 M (400 km) from Mt Davies. 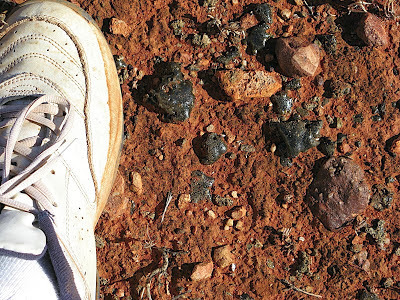 The Mt Davies track is not widely used and permits can be difficult to obtain as it crosses several aboriginal lands. A sign written on the oil drum points up the Mt Davies Road and reads "Good Track. Need plenty of tyres etc. Very overgrown track. Car needs paint job". As we progress slowly westwards, the corrugations get progressively worse but the scenery gets better. Superb rings of spinifex cover the red sand dunes and camels wander on and off the track, mostly on, and why wouldn't they? 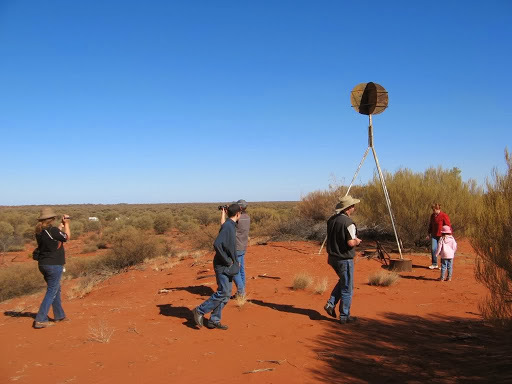 It's direct, smooth (compared with spinifex) and they can see where they're going. At almost the geographic centre of the track, at 2.44 in the afternoon, there was a sudden and very loud clonking from the front drive shaft area of our Oka, so we stopped (obviously) to check it out. An initial inspection didn't reveal anything wrong with the axle or diff or axle shafts, but then I found that the rear of the drive shaft had come loose and had been flailing around hitting the transfer box gear linkages as it went. The "U" bolts holding the universal joint on to the transfer box had worked loose allowing the end caps and needle bearings to fall out, which in turn allowed the shaft to disengage from the transfer box. I took the shaft off and was going to replace the whole UJ unit, but Craig suggested replacing just the end caps from a spare UJ which would be a lot quicker than replacing the whole thing. This we did, and with new bolts holding the UJ clamps in place, everything was greased up and we were back on the road within an hour. But it could have been much worse, the main gearbox and engine sump were right next to the flailing shaft. We also had to do a temporary fix on the damaged gear linkage to get that operational again since it was bent and touching the exhaust pipe. We used extra large plastic tie-wraps (12mm wide) to hold the transfer linkage in a useable position but this worked fine and survived a further 12,000 km without problems. 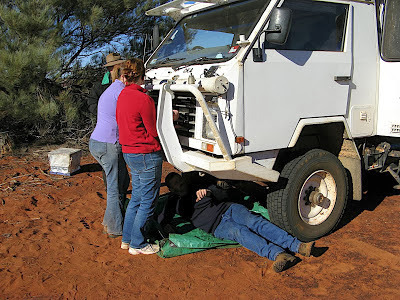 While the blokes were working on the problem, the girls were taking photos of our bums protruding out from under the vehicle. Perhaps it was to ensure that we had a photographic record of the event? Post trip note: The main damage was to the pivot lever on the side of the gearbox which directs the transfer lever action to the transfer box via a ball joint. 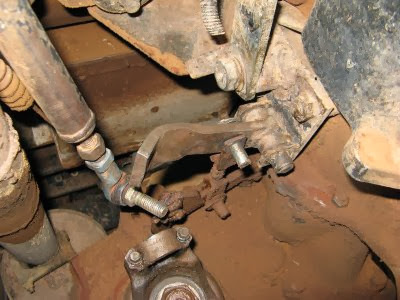 It is a 6mm thick steel lever which was bent severely by the impact of the flailing drive shaft, causing the ball joint to be twisted and the transfer rod to foul the exhaust pipe. It took a lot of effort to bend that straight enough to operate normally again. Vokes Hill Corner is at the junction of the road from Cook on the Trans-Australia railway built by Len Beadell in 1961. Another original plaque is located here (19 nails holding it to the post), dated "from star observations on 2 April 1962". It shows we were 100 M (160 km) west of Emu and 180 M (280 km) north of Cook and only 555 M (900 km) to go to Laverton. It's the only plaque we've seen with a personal message from Len Beadell to "please leave this sign for travel(l)ers". He decided too late that 2 "L"'s were required and added a second. There is a feint track to the actual Vokes Hill, 14 km NW of the junction. It even has a Give Way sign on it. However, the height of Vokes Hill is only 347 m, which is lower than some of the surrounding sand dunes. There must be some other history attached to it. 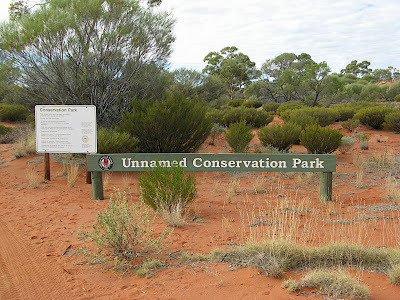 Vokes Hill is within the brilliantly named Unnamed Conservation Park, (which now, after 29 years has a real name, it was renamed the Mamungari Conservation Park in 2006) and extends over 21,000 sq km of pristine arid zone wilderness. The Anne Beadell is the only road access in or out of the park and the name boards had yet to be replaced in 2008. As we moved westwards from Vokes Corner, we kept seeing green posts with numbers on them. 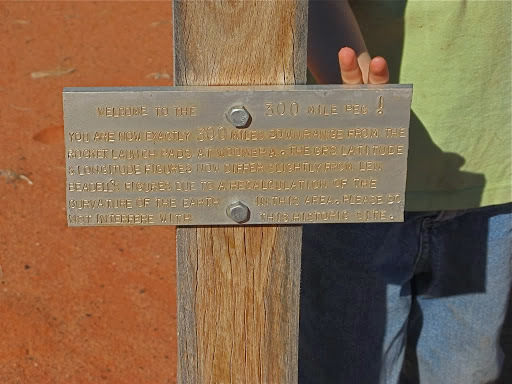 I've since discovered that they are interpretative markers put in place by the Friends of the Great Victoria Desert (FGVD), who are "a volunteer group which assists the rangers in caring for the parks and reserves in the South Australian section of the GVD". The posts apparently indicate the presence of particular species of plants in the area. I wish we had known that before we left, it would have solved a question and added to our enjoyment and understanding of the track. 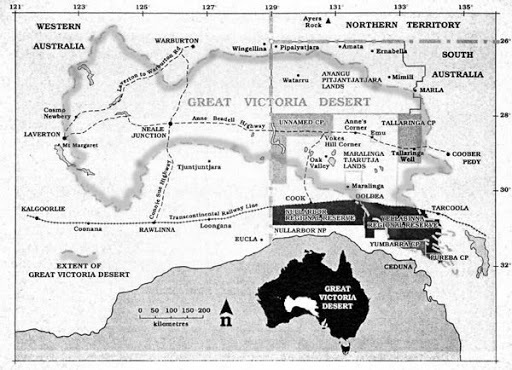 More information can be obtained from the FGVD web site at Friends of the Great Victoria Desert. We met a big UniMog coming the other way and stopped for photos. 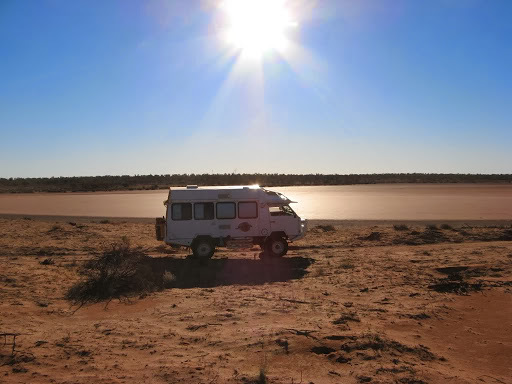 The Serpentine Lakes straddle the SA/WA border and are normally a series of dry salt lakes. Officially they are a "significant palaeodrainage system, comprising ephemeral saline playa lakes". 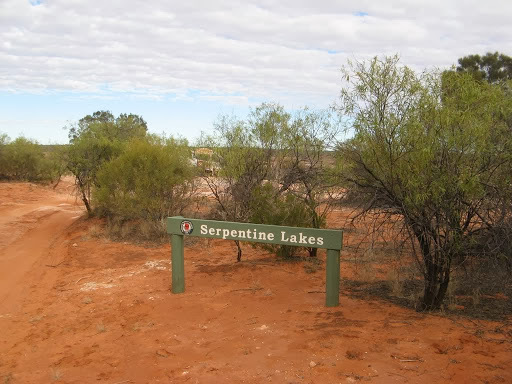 Well they were certainly ephemeral when we passed through in 2008 but they do sometimes flood, see Serpentine Lakes with water (see beadelltours com.au). "A significant palaeodrainage system, comprising ephemeral saline playa lakes"
There was a very steep jump up (or down) on to the lake bed on the SA side but the track across the lake was smooth and dry. The state border is just on the west side of the Serpentine Lake crossing and is marked by another original Len Beadell plaque. 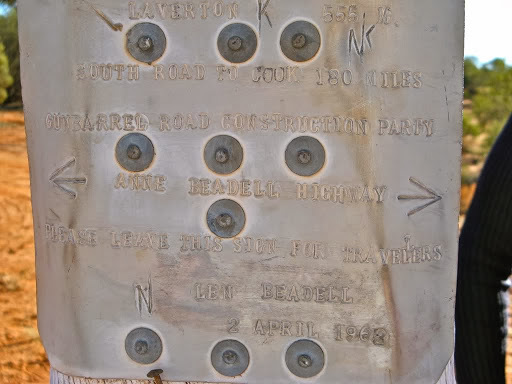 What's interesting on this one is that the distance to Laverton (455 M) is engraved (scratched) on the plaque rather than stamped on. It suggests that it was not Len Beadell who did this since if he measured the distance in his LandRover he is sure to have taken his letter punches with him. The distance to Vokes Hill (110 M) is stamped on as normal. 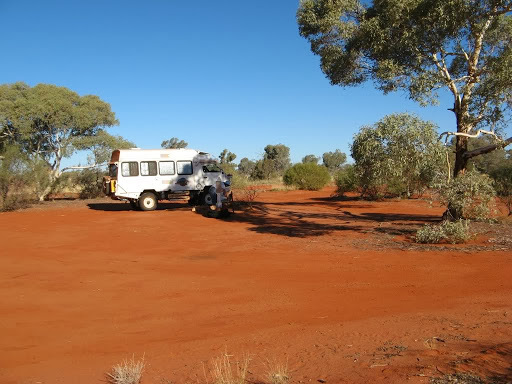 The aboriginal owned Ilkurlka Roadhouse appears as if by magic after a week's travelling. 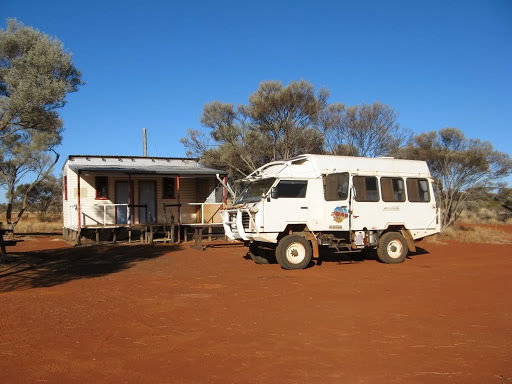 You get the feeling that you will never see civilisation, or even a smooth road again, when suddenly there it is, a campground with a small modern shop, showers and fuel supplies. The manager also owns a grader and the 20 or 30 km either side of the roadhouse are reasonably smooth compared with the previous 1000 km. The manager told us we were lucky to catch him there as he was leaving the next morning to meet someone in Perth, a trip he expected to do in a day! Well it was only 1400 km. 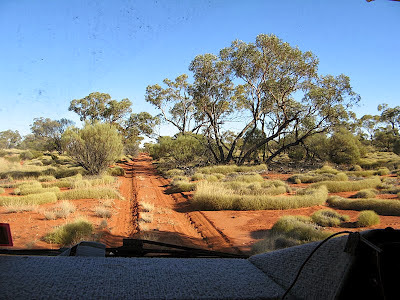 While we were camped at Neale Junction the next night, I was out doing my late night ablutions when there were loud rumblings and crashings and flashing of distant lights from down the track and a few minutes later the manager roared by in his ute. You would think that in the middle of a desert, late at night, you could get on with your business without being caught by the glare of car headlights. But as he rushed past with horn blaring, he gave the very real impression that he really was going to make Perth in a day. 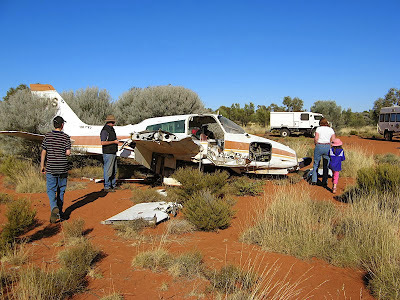 In 1993, a Goldfields Air Services twin engine Cessna crash landed in the desert about 50 km west of Ilkurlka and 6 km north of the track. The crew survived the crash and were rescued. In 1995 a track was formed over the sand dunes to the crash site and most of the plane still remains, except, of course for any valuable parts which have been souvenired. It's a worthwhile diversion but the track is fairly difficult as it crosses about 20 very soft sand dunes in its 10 km. 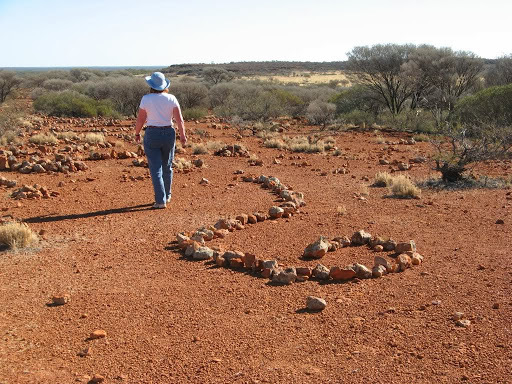 About 25 km before Neale Junction, we came across an abandoned airstrip and nearby were strange manmade, possibly aboriginal, rock arrangements spread out over several hundred metres. These could not have been constructed in an afternoon but had obviously been planned and implemented over a long period of time. The formations are of small rocks placed in circles, lines, zigzags and curves but without any obvious overall design or purpose. They remain a mystery. Interesting but still a mystery. 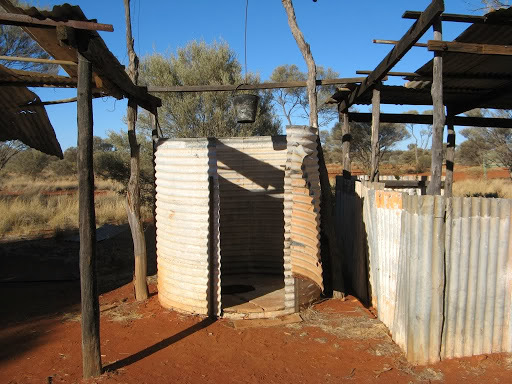 On the WA side of the border, there are 3 rest facilities with toilets and rain water tanks. 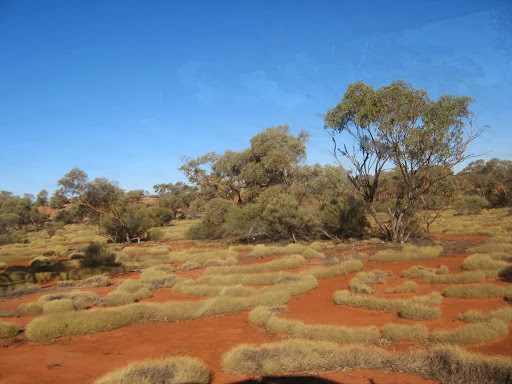 These, apart from the Ilkurlka roadhouse and possibly Yeo Homestead, are the only sources of drinkable water on the Anne Beadell, and even then availability depends on rain. We were lucky that there was some at the one nearest the border and we could replenish our drinking water tank, but it's sensible not to rely on them, or waste the water, and we carried sufficient for the whole journey, even though that meant no showers for a week. There was no water on the SA section of the track, Tallaringa Well was not useable. Neale Junction is an important intersection with the Connie Sue Highway which stretches from Rawlinna on the Trans-Australia railway in the south to Warburton community on the Great Central Road to the north. That's the track we plan to tackle next. There is another Len Beadell plaque and visitors book here. On this plaque all the GRCP members are named, including their dogs Bonnie and Lassie. We are now 600 M (1000 km) from Coober Pedy with 240 M (400 km) still to go to reach Laverton, but even so we began to feel like we were approaching the end of the track. I got in the car to move it from the junction to a camping area and turned on the ignition (which is a bit of a misnomer in a diesel) but instead of a hearty roar there was just a faint click from the starter motor. Now the starter motor is one of the few single-points-of-failure we have in our vehicle, most other problems can be got around but we don't carry a spare starter motor, and this is a particularly bad place to have a failure when it's a single point of one. However the planets must have been in alignment that day since it turned out to be just a loose connection on the battery terminal, tight enough to provide normal power but totally insufficient to start the engine. A twist on the connector was all it took to fix the problem. Later I checked and tightened the terminals on all 3 batteries. The track started to get wider and less corrugated as we left Neale Junction and even the weather was warming up. We'd had freezing nights for the past week or so. 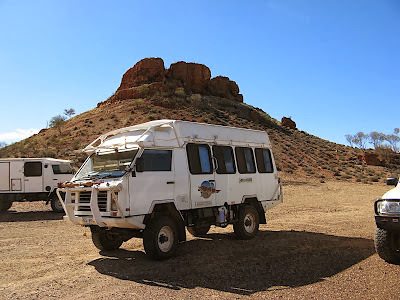 We stopped to investigate Bishop Riley's Pulpit, a rock formation just off the track in the Yeo Lakes Conservation Park and met a large convoy of 4wd's all busily fitting tarps over their radiators. One of them even took a photo of us arriving and posted it on the web. It seems the group was heading off overland (hence the spinifex guards on the radiators), following the route of explorer Frank Hann's 1903 expedition from Laverton to the Warburton area. And cutting off the corner between the Anne Beadell and Connie Sue Highways whilst doing so. 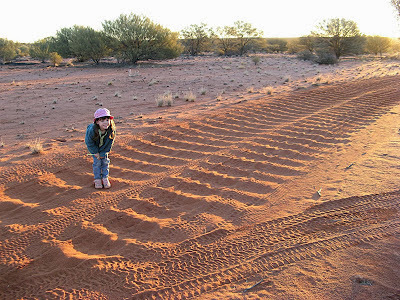 While all this sounds like good fun, I'm not sure I agree with the concept of large numbers of vehicles bush bashing across a pristine desert, even if it is in the name of scientific discovery. Hopefully this group was following established, if unmarked, tracks. Yeo homestead is a restored 19th century wooden house comprising 2 rooms and "outside" facilities. It used to be the homestead for Yeo Station before CALM created the Yeo Lake Nature Reserve. It's a good place to stay for the night, it provides shelter but it's a bit dusty inside. The old style dunny, shower and well down the "garden" are worth investigating. On the maps there are various tracks leading to the lake but after 11 days on the Anne Beadell, we're rather keen to get to Laverton and a real shop. We've marked this down for more exploration on our next trip. In fact the whole of this area looks worth spending more time in. 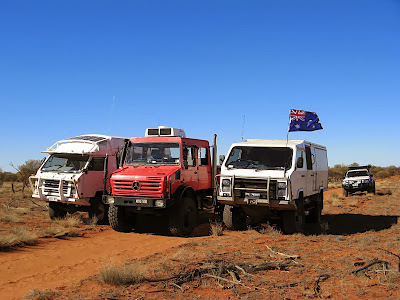 When we eventually reached Laverton, after about 11 days constant travelling due west, we headed down to Kalgoorlie and met up with an old friend at the Oka company there. The chart below shows our speed along the Anne Beadell Highway. Around 25 kph for most of the first 900 kms after leaving Mabel Creek, but definitely slightly faster in the WA section, up to 50 kph plus in sections. Wow! 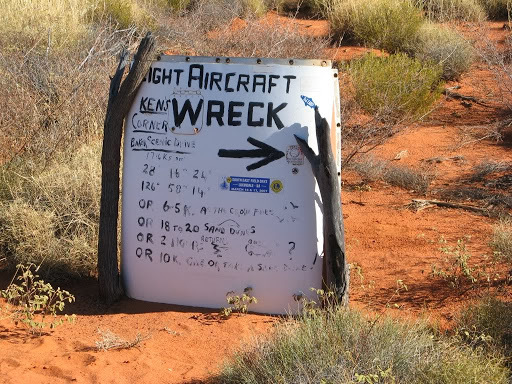 The dip in speed at 950 kms was when we visited the site of the crashed aircraft about 10 kms off the track. There were a lot of sanddunes to cross in that 10 kms. 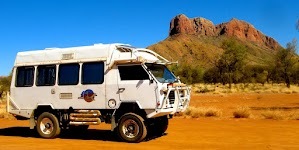 Overall our impressions of the Anne Beadell were that it is very long, fairly flat and not overly difficult, if you and your vehicle can stand the corrugations. There are plenty of things to see and some areas really need more time to explore properly. Although 11 days seemed like a long time to be on one track, it was no where near long enough to take it all in. When we do the Connie Sue maybe we'll use that opportunity to explore the Plumridge Lakes and Yeo Lakes areas better. I spent 6 months out in that country when I was a 20 year old working for the S.A. Mines Dept. on a Seismic survey. Loved it. 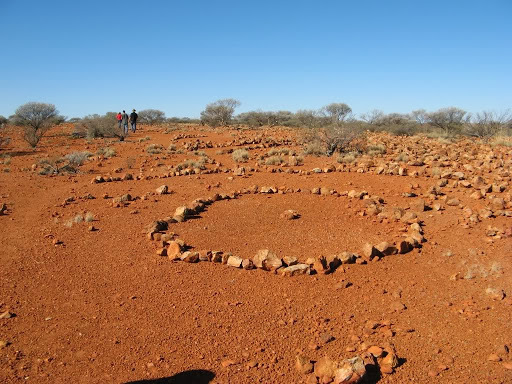 The most fascinating site we visited was the "stonehenge" Len Beadell discovered near Emu. Apparently it pre-dates the local Aboriginals. They have no knowledge of its history. I will re-visit it one day in the next few years and just sit and ponder its makers. Thanks again and happy adventuring.